This tip when you focus or select a field with the cursor the field value will be clear and if you are not fill any thing again recall the default value name. When you focus or select a field with the cursor a toggle message appears on the right side of the field with a short information about the field. Hey nice tutorials.Thanks for the help you posted here.I actually need a help from you.I am struck @ captcha validation...can you help me out with the code.The problem is when i give the wrong captcha verification,the full page is getting re-loaded!! Help me out if its not a pain in the neck! Olá, um ótimo tuturial. Mas não podemos nos esquecer da validação Server-Side que é sem dúvida de maior importância. Good work. A small issue i found out though. 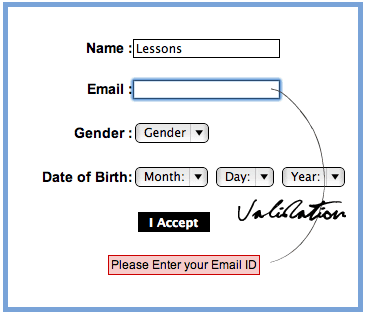 The gender field validation is performed again even if we select a gender. Its good but just showing the message when the cursor is in the text field.And it is not validating the text field not a good client side validation.